Announcement Welcome to JM Artisan Jewelry! If you don't find what you are looking for in my shop~ please contact me as I love creating custom pieces! **CURRENT PROCESSING TIME:1-3 business days. I create each piece by hand with you in mind. I love offering a variety of items for any occasion! 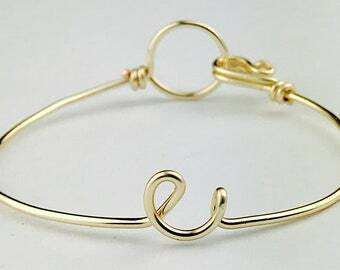 Custom Wire Name items available. First Class Shipping estimated delivery time is 2-5 business days depending on your location and the speed of the Post Office. Priority Shipping estimated delivery time is 1-3 business days depending on your location and the speed of the Post Office. All packages are shipped First Class unless you choose the Priority Shipping Upgrade. To choose upgrade~ After adding an item to your cart, click the Cart link at the top right of any page. You'll see a drop down menu that says Standard Shipping to the right of your item that will allow you to choose the upgrade. Tracking is provided as I use Etsy shipping. You will find your tracking number on your receipt under "your purchases". Please make sure your address is correct. I am not responsible for wrong addresses. ****International Customers: Please take note: I ship through Etsy Shipping and your purchase price will be on the customs label. I can't change it for you. Please be aware that your country may charge a tax/VAT fee on your purchase. This is your responsibility. If you are unaware of this and need to cancel your order please convo me right away. ****If your package has been scanned by USPS and does not get delivered it is not refundable**** Priority packages do carry 100.00 in insurance. That will be covered if it is sent priority. BULK PRICING - Please contact me BEFORE ordering if you have any questions. ♥ Buy 5-9 of the same item you will receive a 5% discount. ♥ Please request your discount in the "Note to Seller" box at checkout and I will issue a refund for the discount after the purchase has been made. Thank you for visiting Isle of Agápë®! Welcome to JM Artisan Jewelry! If you don't find what you are looking for in my shop~ please contact me as I love creating custom pieces! 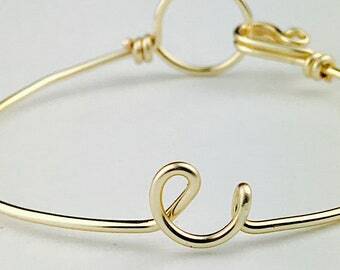 breathe bracelet. breathe. just breathe. Getting ready for Mother’s Day and Celebrating all of the beautiful ladies out there! This is a bracelet I made for a custom order. I created it with 14K Gold Filled wire. Jm Artisan Jewelry is the place "where passion meets purpose". Your passion becomes my purpose. I love creating pieces that you can connect with and share with others. In short, my jewelry creations are all of my passions wrapped in a tiny package to share with others.